Monster Energy Supercross is a game that took me by surprise only a month ago. It was then that I previewed it at a hands-on event in Milan at Milestone S.r.L’s headquarters. There’s always a difficulty in having previewed a game. What can you say that you haven’t already covered? Is there anything new to cover? Has the game changed much at all? These are all major considerations. It helps if there’s been a reasonable length of time between the preview and the review. There is also the simple fact that previewing a game at a special event does lead to unrealistic conditions. The machines are often more powerful than those at home, and you rarely end up playing an inferior (read: console) version of a game. It can lead to heightened expectations. Sadly, this is the case with Monster Energy Supercross, though not to too high of a level. 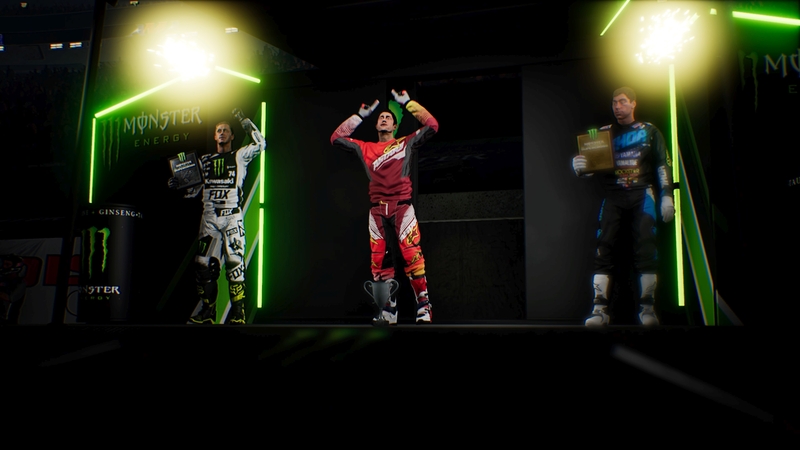 As I mentioned in my preview, Monster Energy Supercross is one of Milestone’s best looking titles yet. However, playing on the PS4 Pro shows a significant downgrade from the PC version I had a hands-on with before. While a number of the smaller effects are still there, clothes flapping, dirt on the screen, the glare of stadium lights, it’s not nearly as attractive. While this will be as a result of playing a console version rather than the PC version, there’s little excuse for a number of issues the game faces. There are also a fair number of quite low quality textures, particularly just outside of the track boundary. Trackside staff pop in abruptly and back out equally so, anybody would think they had Romulan cloaking technology. Worst of all is the slowdown that happens whenever too much is happening at once. I’ve felt the same drop in framerate on the first corner of every single race. If you don’t get close to the front, expect it to last a bit longer than just the corner. At least the visual issues don’t extend to the riders and bikes. At least for the most part that is. When you start a career mode you’ll create your own rider. Thankfully this rider will naturally have their helmet on at all times, because the face and skin beneath that helmet is both limited in number, with ten to choose from. All of these are something straight out of a waxwork horror house. The actual outfits, helmets and bikes? All of a very high quality. It makes sense because Milestone have had long-running relationships with these companies. The Yamaha, Honda, Kawa, and other bikes will be used in a large number of games so getting them right once allows them to be used again. This also applies to all of the customisable parts of the respective bikes, and the riders themselves. If there’s one thing that can be said, the game certainly looks good when you focus on the riders above all else. There are a few issues that haven’t been fixed from the preview either. 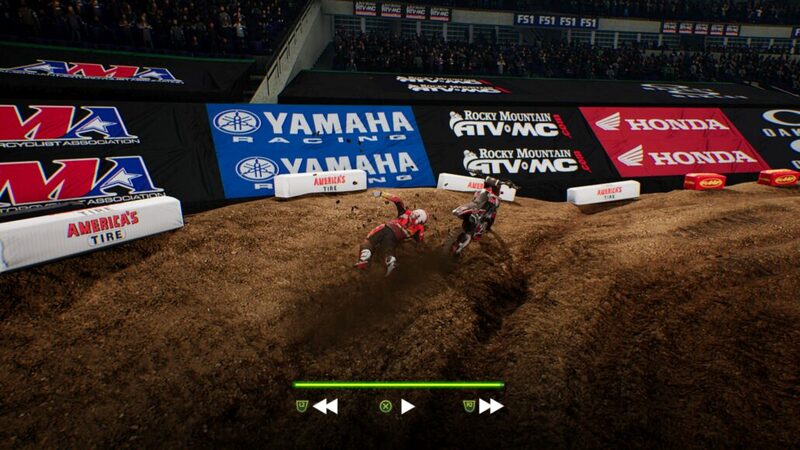 The first is just how floaty Monster Energy Supercross feels when you collide with another rider or the track barriers. Spawning after a collision or fall is equally broken, with you – and the AI – just plopping right into the middle of the track regardless of any traffic. The number of collisions I’ve had as a result of that are unfathomable (more than ten). Thankfully, the rewind system does come in useful whenever that happens. One thing that has remained, and seems to be working perfectly is the real-time track deformation. While it isn’t as visible as in other titles with ongoing deformation of tracks, it still works out very well. As a race continues, the consistency and level of dirt changes at different parts of the track. This directly impacts everything from your grip, speed and handling. This is impacted even further if the condition changes from dry to wet. And this is where the game is at its best. While it does have the aforementioned floaty physics upon collisions, everything else feels pretty great. There’s a sense of weight to the bikes that hasn’t been there in Milestone’s MXGP titles. This doesn’t mean the game has gone for total realism. With settings set to an easier or more moderate approach, it’s still more arcade than anything else. Outside of the racing, what else does Monster Energy Supercross have to offer? Truthfully, quite a lot. The core of your game will be in the career mode. This has you create your own rider and build yourself up to the best you can be. As you win races you earn points to spend on the cosmetic items that you unlock as your level grows. 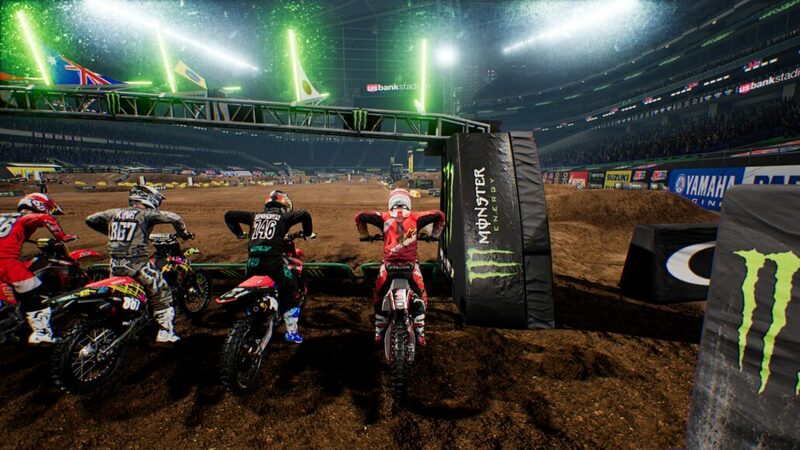 Beyond the career, you have the opportunity to recreate the 2017 Supercross season in Championship mode. This lets you ride as one of the riders who actually participated in the season. You also have the ability to create your own championship as well, adding in and removing tracks as you like. You also have the option to jump into single races, time attacks or even create your own tracks. This is arguably the best feature of the game. I praised the track editor back in the preview and I have only praise for it now. It’s one of the most well developed and well-realized track editors to be found within a game. There are a wide variety of options of tracks you can create, with few limitations. 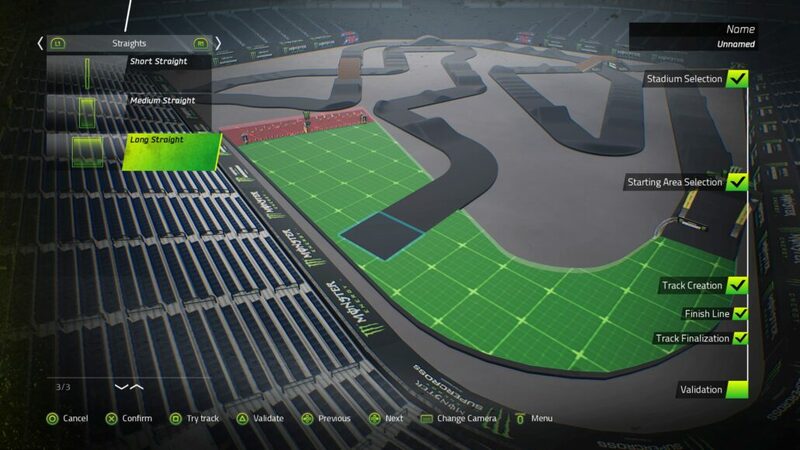 Create your track using a large variety of jumps, turns, bumps, bridges and more. Taking this track online and sharing it with others, as well as downloading other people’s creations can extend the life of the game exponentially. Sadly, this is about the extent of the online functionality. Of course, you do have the ability to ride against other people online. Races can feature up to twelve riders in total, with any number being under the control of the AI. The core issue is that it is peer-to-peer. This inevitably means that you’re bound to encounter a fair amount of lag, drop-outs and freezing. It’s a shame because racing your, and others creations online could be the feature that takes this game to the next level. This is one of the few times I’ve personally experienced a game fall in quality from preview to review. I can mostly attribute this to the difference in format. That still doesn’t forgive issues like the floaty physics when colliding with another racer or the track barriers. What there is to say about Monster Energy Supercross is that it is an improvement from Milestone on the MXGP series. It certainly can be gripping and it’s more than challenging once you get the settings right. Racing through your own career is pretty fun to say the least. The only thing is that, like other Milestone titles, it has its issues that could do with working through. PS4 version reviewed. Copy provided by the publisher. You can purchase the game on Amazon. What there is to say about Monster Energy Supercross is that it is an improvement from Milestone on the MXGP series. It certainly can be gripping and it's more than challenging once you get the settings right. Racing through your own career is pretty fun to say the least. The only thing is that, like other Milestone titles, it has its issues that could do with working through. A strong level of customisation options for both your rider and bikes. One of the best track builders to be found in a racing game. Very high quality visuals of the bikes, core elements of the track and the clothing of the riders. Floaty physics, particularly when coming into contact with other riders or sides of the track. Online mode is flawed at best, being peer-to-peer which results in a myriad of issues. A few issues like frame-rate when the game gets busier.